Like staying at your grandmother's in the country side. 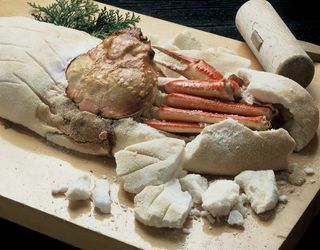 The building is retro, but we do serve world class crab dishes. 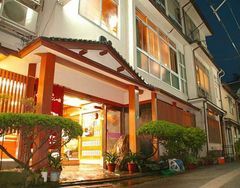 Centrally located and perfect for walking around to all the public outdoor hot springs. The inn is everything but fancy, an old fashioned 3 story wooden building with only the basic of facilities. We are known as the oldest looking inn with a bit of a retro fragrance. Even so, half of the travelers to our inn have become regular guests and thanks to them our simple little inn has thrived. Our main selling point is our cuisine. Especially our individually prepared rich meals that use freshly caught seafood from the local market. Each meal's quality and quantity are sure to satisfy any guest. Also, we treat our guests like family. Giving them the feeling like they are staying over at their favorite grandmother's house in the country. 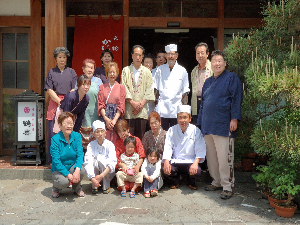 In fact the majority of our staff are grandmothers and mothers from the area. Our simplicity may not be ideal for some, but we encourage anyone to give us a try. Who knows, you might fall in love with our simple little inn. Front of Kazan building. All rooms are Japanese style with bidet toilets. Public bath uses 100% natural spring water. 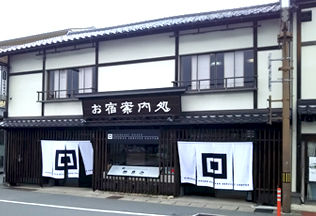 Front of Tsuruki building. All rooms are Japanese style with bath and bidet toilets. A higher class style. Family run, our staff is always smiling and waiting to give you a warm welcome. A small inn with a feeling of family. Main Bldg: 10 Japanese style room no restroom/bath/veranda, Bldg.Kazan: 10 Japanese style rooms with bidet restroom. 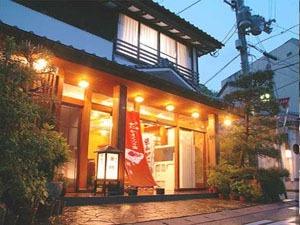 Bldg.Tsuruki: 6 Japanese style rooms with veranda, bath, bidet restroom. All rooms have T.V., A/C unit, refrigerator. Playstation rental available. All buildings (Main, Kazan, Tsuruki) use 100% natural spring water. The public hot springs bath in our inn is normal tile, but you can feel the distinct thickness and scent of the natural hot spring water against your skin. 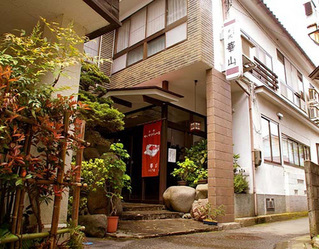 Guests are welcomed and encouraged to experience the "true nature" of Kinosaki's hot spring water. There is one public bath in the main building(1st floor) and two in the Kazan building(2nd floor) that can be used for private bathing for families. There are also 2 public baths in the Tsuruki building(1st and 2nd floor) that can also be used for private bathing. These baths can not be reserved, instead you are welcome to use them when they are open and lock the door for privacy, but please be courteous of the other guests who also wish to use the baths. Bath towel, face towel, toothbrush set, yukata (cotton kimono) can be found in the guest room. Shampoo, conditioner, body soap, bar soap, shavers, hair dryer, and other bathroom amenities can be found in the rooms with a bath.